Forget day-trading. Grab these stocks and hold them for decades. The best way to predictably generate wealth is to buy and hold stocks for long periods of time -- and we're not talking about days, weeks, or even months. Truly life-changing gains are reserved for those investors willing to hang on to great stocks for years or even decades. To illustrate that point, we asked three Motley Fool contributors to each find a stock that they think investors could hold for the next 50 years if they so choose. Read on to learn why they picked Alphabet (NASDAQ:GOOG)(NASDAQ:GOOGL), Procter & Gamble (NYSE:PG), and Johnson & Johnson (NYSE:JNJ). Steve Symington (Alphabet): Given its massive size and global industry dominance, it's easy to forget that Google, which is now held under parent company Alphabet, was "only" founded 20 years ago in 1998. But perhaps most incredible, Alphabet is still enjoying staggering growth even from its enormous base. Revenue last quarter climbed 21.5% year over year to $33.74 billion, translating to net income of over $7.8 billion, excluding a one-time gain to net income of roughly $1.4 billion related to its venture capital businesses. For that strength and jaw-dropping profitability, the company can largely thank Google's core advertising business, supported by its portfolio of wildly popular products. In fact, at the end of last quarter Google boasted eight products that each have at least 1 billion monthly active users, including Google Search, Drive, Gmail, Maps, YouTube, Android, the Google Play store, and Chrome. Keeping in mind that more than half of the world's population still doesn't have access to the internet, these products create a network effect and competitive moat that should ensure Alphabet can consistently create shareholder value for decades to come. Even then, Alphabet has other irons in the fire that could significantly expand its reach outside advertising. Take Nest, for example, through which it offers smart thermostats, security cameras, and smoke and carbon monoxide alarms. Or consider its Waymo self-driving-vehicle subsidiary, Fiber high-speed internet, Google Home hardware devices, and its popular Pixel line of smartphones. Finally, with almost $102 billion in cash and marketable securities on its balance sheet, Alphabet also has the luxury of keeping its eyes open for attractive acquisition candidates to supplement its organic growth. With shares trading at a reasonable 21.7 times this year's expected earnings -- and even from its huge $715 billion market cap today -- I think Alphabet is one of very few stocks that investors can comfortably buy and hold for the next 50 years. Reuben Gregg Brewer (Procter & Gamble): Procter & Gamble has thrived in the highly competitive consumer-products sector for more than 100 years. Today it's a $230 billion-market-cap Goliath, with a diversified portfolio of iconic brands that includes Bounty, Gillette, and Pampers. 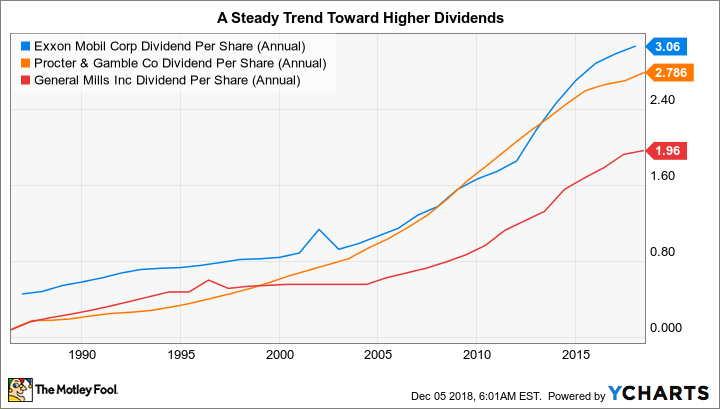 More important for long-term investors, it has increased its dividend annually for a mind-blowing 62 years -- in other words, it has rewarded investors through both good markets and bad. That's important today, because P&G is trying to adjust as consumers increasingly lean toward natural and healthy products. To that end, it has sold off non-core brands to refocus on its best assets. The remaining portfolio, meanwhile, has been getting an overhaul, with improvements in quality, updated messaging to reach customers online and off, and new "on-target" versions of older brands all a part of the effort to supply end users with what they want today. It hasn't been a smooth transition. However, it appears P&G is starting to see some success: Organic sales advanced 4% in the fiscal first quarter. Notably, the beauty business, where organic sales are up 7% and management has been highly focused on upgrading products and branding, was a particularly strong contributor. This performance shows that, when management gets the equation right, results are strong. With the company's generous 3.1% yield, investors looking to own a company for decades should strongly consider P&G. It's adjusted many times before and continued to reward investors, and the current business shift is just more evidence of the company's long-term staying power. Leo Sun (Johnson & Johnson): Johnson & Johnson's stock rallied nearly 2,700% over the past three decades, as its three core businesses -- pharmaceuticals, consumer healthcare, and medical devices -- generated consistent growth through economic booms and busts. J&J also has raised its dividend annually for 55 consecutive years -- making it an elite "Dividend Aristocrat" of the S&P 500. On the surface, J&J's growth seems anemic. Analysts expect its revenue and earnings to rise just 2% and 6%, respectively, next year. However, J&J's high-growth pharmaceutical unit continues to grow on robust demand for its blood cancer drugs, Imbruvica and Darzalex; its prostate drug, Zytiga; its anti-inflammatory drug, Simponi; and its psoriasis treatment, Stelara -- which are all offsetting declining sales of Remicade, its former blockbuster drug, which now faces generic competition. Its consumer unit is generating steady growth with well-known products including Tylenol, Band-Aids, and Neutrogena skincare products, while its medical device unit is stabilizing as it divests weaker product lines such as diabetes devices. Simply put, J&J's portfolio remains so well diversified that it's practically impossible for major headwinds to knock the entire business off course. That's why J&J's stock rose about 6.5% over the past six months -- even after pulling back in recent days given turmoil surrounding a years-long talc product lawsuit -- as the S&P 500 declined nearly 9% on concerns about trade tensions and rising interest rates. J&J should remain a safe haven for rattled investors for the foreseeable future, and it's likely to remain a solid long-term investment for the next half-century and beyond. What you've read here doesn't mean investors should buy these stocks and completely forget about them. Much can change in 50 years, and of course shareholders should keep tabs on their holdings to be sure their buy theses remain intact. But given Alphabet's industry dominance and multiple avenues for future growth, and the vast product portfolios and long history as Dividend Aristocrats for both Johnson & Johnson and Procter & Gamble, we believe they could be a worthy long-term addition to virtually any portfolio.